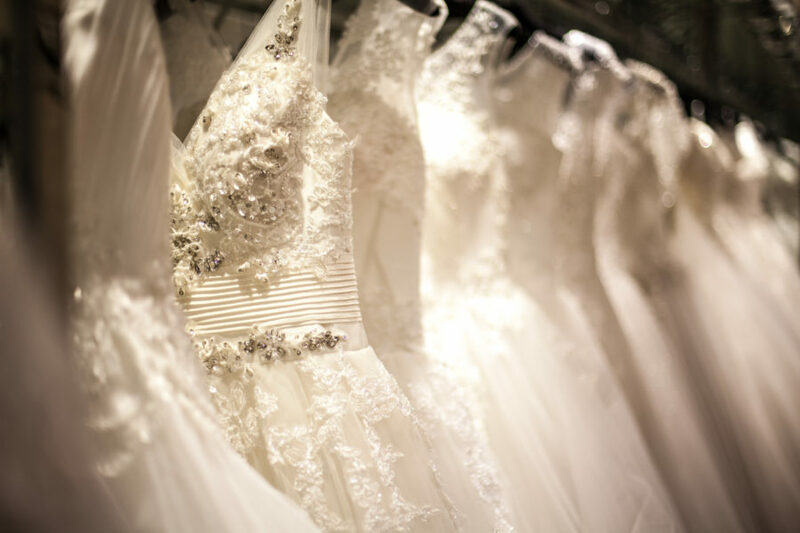 Shopping for your wedding dress is an exciting and overwhelming experience. After all, your this gown will likely be the most important (and expensive!) item of clothing you’ll ever wear. For a successful and stress-free shopping experience, keep these ten things in mind during your time at the bridal salon. 1. Never stray from your budget. While shopping for a wedding dress, you may fall in love with a drop-dead gorgeous gown before realizing it’s outside of your price range. Prevent potential heartbreak by trying on gowns that fall safely within your budget, and never test elaborate designer dresses “just for fun.” Also, keep in mind that budgets include more than your wedding dress; brides also need to shell out money for alterations, taxes, and accessories. 2. Don’t get sucked in by deals. Never buy a discounted gown simply for the deal. While a reduced-rate designer piece may seem irresistible, it’s best to find a gown you truly love—even if it doesn’t have a widely-recognized label. 3. Dresses look different on the hanger. Your consultant may suggest trying on a gown that looks shapeless and frumpy on the hanger, but don’t shrug it off immediately. Many dresses undergo a complete transformation once on the body. You may adore a dress you normally wouldn’t give a second glance. 4. Love your gown from all angles. 5. Test out the gown’s comfort. You’ll have to sit, stand, walk, and dance on your wedding day. At the salon, take the gown on a test run to ensure it’ll stay comfortably fitted throughout these various activities. No woman wants to wear something that restricts her ability to bust a move! 6. Happy tears won’t always happen. On reality shows, the bride-to-be often breaks down in happy tears after discovering her dream dress. In real life, however, many brides won’t have this “aha!” moment. Think twice before letting the lack of emotion alter your decision; if you truly love a gown, and if you can purchase it without regrets, you may have found your perfect match. 7. It’s okay to second-guess your decision. 8. Focus on your happiness. Perhaps the most important piece of advice: Choose a dress that you love. Your entourage and consultant will have their own opinions on each wedding gown, and it’s nearly impossible to please everyone. To avoid feelings of regret and resentment, always follow your heart, and choose the dress that makes you happiest.